Skopelos town in Skopelos. Accommodation. Beach. Restaurants. 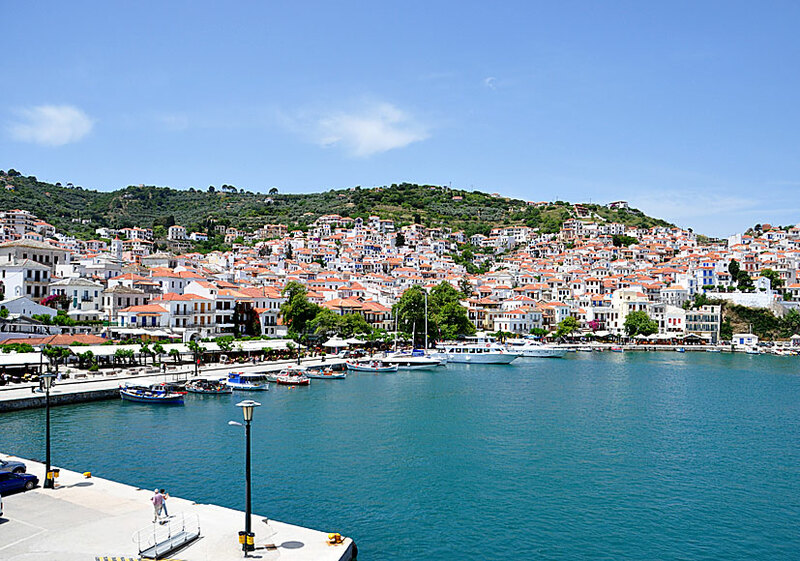 Skopelos Town is one of the most beautiful towns in the Greek archipelago, perhaps even the most beautiful. It does not matter from which direction you look at the town: from above, from below, from within, from the sea or from the mountains - it's always beautiful. It is a conglomeration of whitewashed houses with red tiled roof that amphitheatrically climbs uphill in lush surroundings. Countless alleys winds seemingly aimlessly from the port, up through the village. Some alleys are so narrow that one hardly can pass trough, others are so steep that one almost can not manage to walk in them. It's easy to get lost, many times you come out where you went in without knowing how it happened. But it doesn't matter, there are so many beautiful houses and beautiful churches to enjoy. The architecture is amazing, no house is like another, even if it seems so from a distance. Several houses have slanting red tiled roofs, the older houses have grey slate roofs. 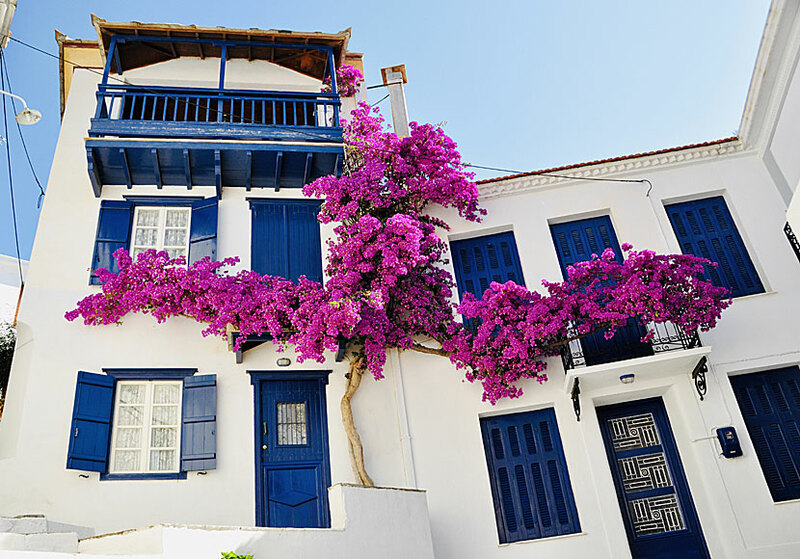 Beautiful houses and bougainvillea in Skopelos town. Many houses are adorned with colourful balconies of wood, on the balconies geraniums grows in terracotta pots and empty olive oil cans. The only thing missing in Skopelos town is a good beach. The beach there is not much to cheer about. 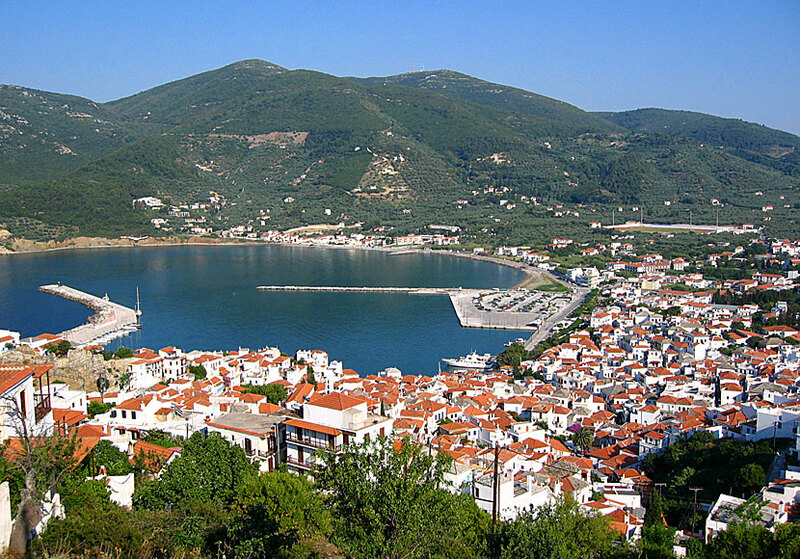 The good beaches closest to Skopelos town is Stafilos and Velanio. 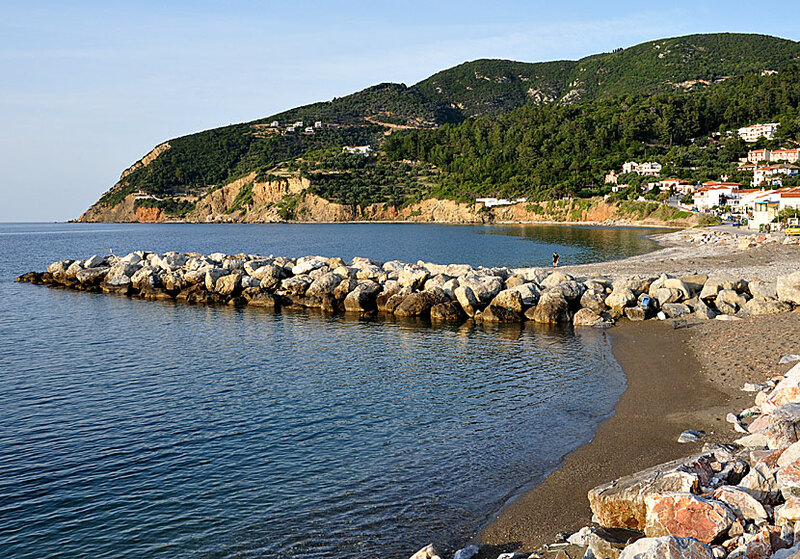 The beach in Skopelos Town. One could say that the town is divided into four parts. The picture at the top of the page is taken from the road above Skopelos Town. To the left you see a bit of Kastro which is the oldest part. The houses in the middle were built when Kastro became too crowded. To the right is the slightly newer part of the town, here are many large houses with nice gardens. The large cement plate in the centre of the picture is a car park and a docking place for ferries and catamarans. To the right of the pier is the beginning of the waterfront promenade that stretches all the way to the breakwater to the left. The breakwater also functions as a guest port. The houses furthest away in the picture, at the foot of the mountain, belongs to the touristic part of Skopelos Town: here are several package holiday hotels, car and scooter rental places and a beach. In the hills above are several interesting monasteries. Part of the water front promenade in Skopelos town. The most interesting parts are Kastro and the neighbourhood to the right of Kastro. The Kastro itself is small, here are some of the town's nicest churches, including the Panagia to Pirgo which has become something of a symbol of Skopelos. There is only remains left of the old city wall. Perched on top of Kastro is one of the island's most cosy tavernas: Ouzeria Anatoli. 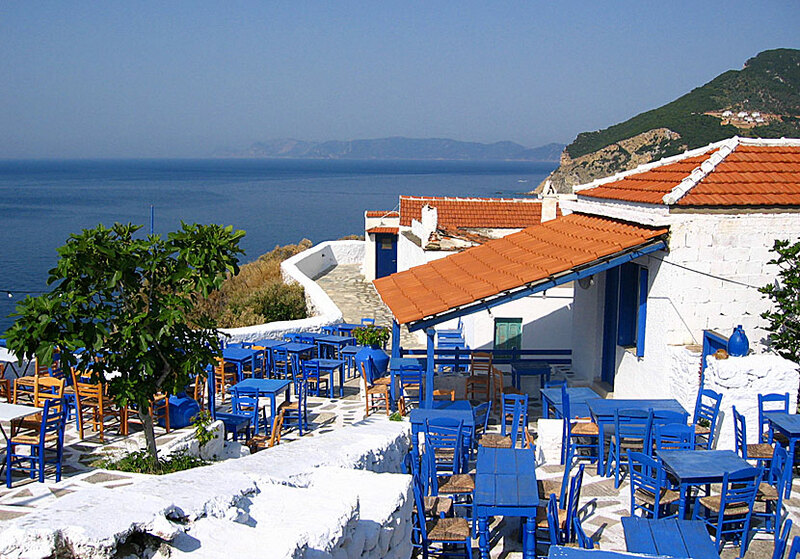 Here you can delight in good Greek food, live music, dancing and wonderful scenic views. The band consists of guys from the island who plays Rebetika music with sense and bravura. Imagine sitting here after a good dinner sipping an ouzo or a cup of coffee, the sorrowful but beautiful music fills your heart, when you turn your eyes upwards you will see a pitch-black sky filled with stars, looking out over the sea you may see an enlightened ferry on the horizon, beneath you the houses in the town gleams like diamonds. One can hardly imagine a more beautiful and magical place than Kastro in the evening. If you want hustle and bustle you have to make for the waterfront where you will find many tavernas, cafes, fast food places, banks, travel agencies, galleries and souvenir shops in a long row. The selection is huge, even if you stay for two weeks you will not have time to eat at all tavernas. In the evening the waterfront esplanade is closed for motor traffic, not even scooters are allowed. Strolling villagers and tourists take over instead. The tavernas are slowly filled with expectant guests. To choose a taverna is not easy, many looks like tourist traps, but appearances are deceptive, all we've tried have been good. The food is both good and plentiful, probably because most of the tourists are Greeks. And maybe that's why the barkers (yes, they exist) are not so stubborn. 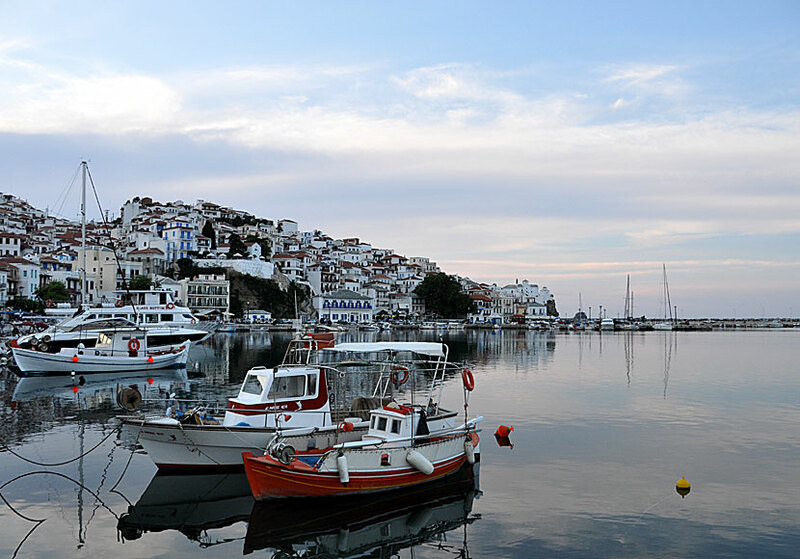 Skopelos Town in the evening. If you're looking for Greek food of the best kind you can eat at one of the tavernas located between the town hall (white house with blue windows and balconies) and the church of Panagia to Pirgo below Kastro. A bit further along the waterfront lies Taverna Kymata which also has very good food. It is said that Kymata is the oldest restaurant in Skopelos Town. You do not have to look at the menu, instead, go into the kitchen and choose among the dishes available for the day. Another excellent restaurant is Perilovi close to Platanos Square. If you like gyros you just stay at Platanos Square where there are several gyros places. The square should be renamed to Gyros Square. Some hotels are fully booked by package-holiday operators, but there are plenty of accommodation so there is a place to stay even for those who are travelling independently.